A properly maintained roof has long life but a poorly maintained roof may fail in less than half of its life. You can extend the life of your roof by leveling and maintenance services. Trash, debris and leaves accumulation restrict the flow of water it can cause premature leaking. Tetra contractors help you to reduce roofing costs by extending the life of your roof with proper cleaning and maintenance services. It helps you to reduce cost and identify the correct potential problems in time. It saves the unnecessary cost due to roof leaks. 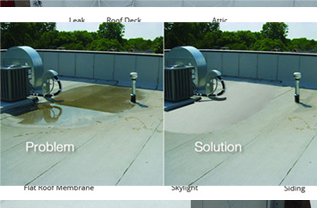 We help you to maintain your roof level and appearance. We customize your roof maintenance to meet your leveling needs and within your budget.